Where appropriate Intelligence Analysis Training Ltd courses are mapped against the UK ‘Skills for Justice[i]’ National Occupational Standards. National Occupational Standards (NOS for short) are statements of the standards of performance individuals must achieve when carrying out functions in the workplace, together with specifications of the underpinning knowledge and understanding. In a nutshell NOS’s describe the competencies you need to demonstrate, know and understand to carry out your job proficiently. They are developed around the skills, knowledge and understanding that employers and practitioners agree someone needs in order to be able to do a particular job well. They set the nationally agreed standards of good practice for that role. They are a useful tool for making sure the job descriptions, roles and responsibilities and appraisals relate to those nationally agreed standards. They are also useful for identifying in which areas someone needs to develop their skills and knowledge so they can do their job well. 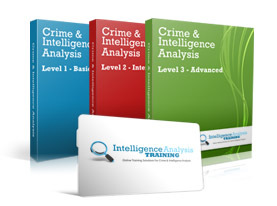 While training providers such as Intelligence Analysis Training Ltd and people offering informal skills and knowledge development can use them to plan their training and learning so that it is relevant to the nationally agreed standard. What are they be used for? Employers and awarding organisations find Nos’s useful for managing the workforce and to form the basis of qualifications in a particular area or function. NOS’s are also used in the UK as the basis for National Vocational Qualifications and Scottish Vocational Qualifications. NVQ’s (and SVQ’s) are work based awards that are achieved through assessment and training. One of the benefits of a NVQ is that they test your ability to actually do the job, which makes them suitable to undertake whilst in work. A key part of a NVQ includes proving that you can do certain work-related tasks. This is assessed through a personal portfolio where you build evidence of the work you have done, and by observation and questioning. Both our online and classroom courses where appropriate are mapped against the NOS’s. It should be remembered that no course is expected to meet all NOS’s as other forms of assessment as previously mentioned are used in conjunction with formal training i.e. portfolio based evidence. [i]Skills for Justice is a Sector Skills Council (SSC) licensed by Government and part of the JSSC group, a company limited by guarantee and a registered charity. Skills for Justice is an impartial, employer-led organisation which takes its lead from the needs of employers from the sectors in which they work. In addition, they are the Issuing Authority for Apprenticeship frameworks in England and Wales for the sectors covered by there license.